Customer Feedback about the PointMaster tool. “This is a must. Fantastic tool. One of the best things i have ever bought.....I'm in the process of pointing over 4000 bricks and have started by using the point master. I can't begin to explain how Brilliant it is! in one day i have infilled and ironed up over 1200 bricks and I was in no way rushing. In my estimate I will be finished at least four days earlier than estimated, so I'm quids in by at least £140 a day - work it out for yourself. "Say goodbye to the needle pointer, hello PointMaster" thats my motto now. I run my own Property Maintenance & Repairs company so I'm not a DIY'er. ” ... G. Hyde. "I'm a builder and I don't take on repointing jobs because they take too long and are too expensive on labour. Until now - since I bought this tool, which is just excellent.... A highly recommended part of any builder's or even DIYer's tool kit. 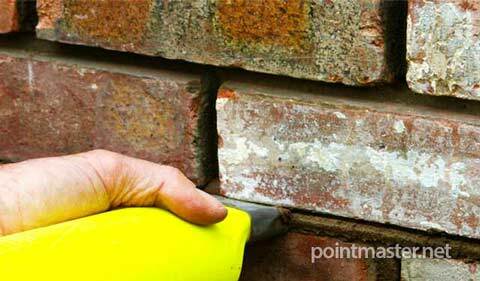 You'll cover the cost ten times over on your first pointing job. Simply put, it does exactly what it's supposed to do - and well!" 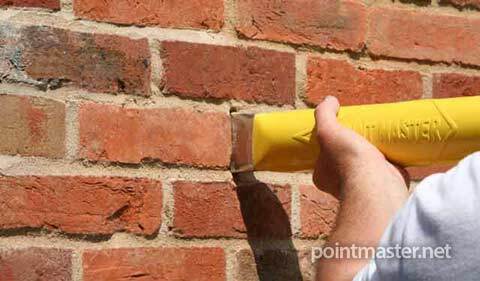 "I bought a Point Master several weeks ago, and have used it for the first time on a literally MASSIVE repointing job - a huge old Victorian Mill in Matlock, Derbyshire. The job would normally have taken six weeks. I finished it in three. Great product, can't ever see me doing another job without it"
"Hi there. I Have just purchased the Point Master tool from you. 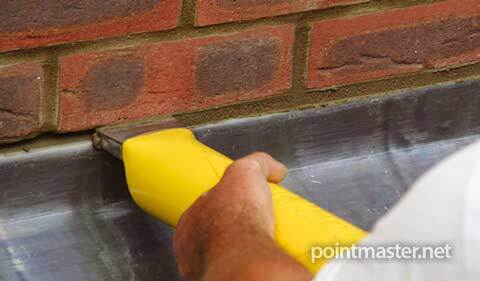 I have been in the brickwork trade for over 20 years and must commend you on such an amazing product that actually works. Very well done. Would recommend 100 percent to anyone in my trade." "I wish I had found it sooner! ... it certainly makes the job hugely easier and the price makes it an easy decision. I am very sceptical of claims that a tool can make a skilled job like pointing easy - I was genuinely surprised that this tool works as advertised. 10 out of 10." "I needed to point a very old and decrepit brick garden wall which was falling apart due to years of ivy encroachment and in danger of collapse. 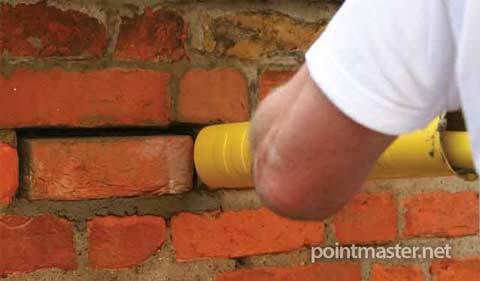 I thought that I would have to spend many days painstakingly trowelling mortar between the bricks and I thought surely someone, somewhere must have a solution like a large cake icing bag to squeeze the cement into the gaps in the bricks... While searching online for advice I came upon a video demonstration for Point Master and thought my prayers were answered. I purchased Point Master online and yes...my prayers were answered in full. This gadget works as described!!!! and the job was done beautifully in one day! I have since used my Point Master to tidy up garden paving at my house and my son's patio. My advice....get one!!" "This product really does what it says on the box! It's like icing a cake - but using mortar instead. My tip is read the notes and view the video on the manufacturer's website but take it steady until you become more experienced. A really neat solution giving a really neat job." 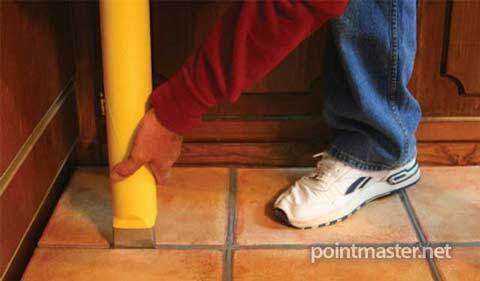 "As an ordinary DIY'er with 150 slabs to re-point on the patio every couple of years I have tried everything from dry mixes to patio grout. I used the Point Master recently and it does exactly as it shows on the video. It works so quickly... 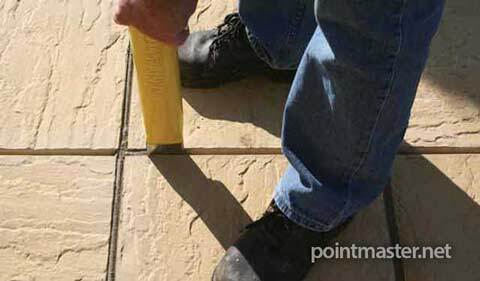 It is robust, easy to clean, the finish is excellent and when I walk on the slabs they feel a lot more solid than before probably because the cement has filled right into the joints. Great product!" "At last! someone's come up with a tool that doesn't squeeze all the water out of the mix. thank you"
"The Point Master has changed my way of thinking. I always disliked Pointing and Grouting, but now using the Point Master I really enjoy doing it!" ... A Barker"
"The only problem with this tool is that if you have not done the job the hard way you will not appreciate how easy this tool makes it. I got consistently good results from my first try with it. I spent weeks last summer pointing the end wall of a house by hand as a DIY project. 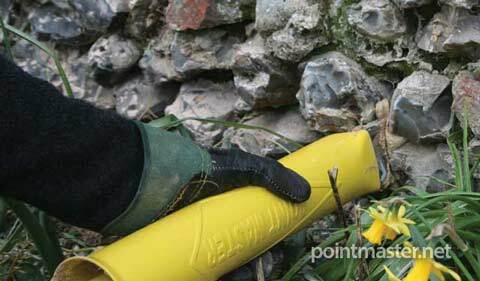 Lots of dropped and spoiled mortar. Time consuming and fiddly. This year I found this tool and did the end wall of another house in a day. I really wish I had found this tool a year ago...."
Observations from tradesmen regarding pointing methods.